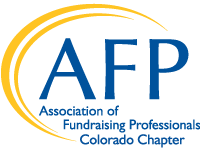 AFP Colorado Chapter is committed to offering the best educational opportunities and services to thousands of fundraising professionals in our community. Thursday Thoughts is the perfect vehicle to reach highly-engaged and targeted influencers in the fundraising profession. This weekly e-newsletter reaches over 360 AFP Colorado Chapter members plus another 1,600 individuals who have signed up to receive our newsletter – many of them are fundraising professionals or individuals who work with nonprofits. We offer two options for advertisements in our weekly newsletter. Advertising is available on the first come, first served basis with a maximum of two ads per issue. Electronic artwork is due no later than Tuesday at noon prior to publication on Thursday and must be submitted as a JPEG file. Please send artwork to info@afpcc.org. Questions? We can be reached at 303-394-6388.